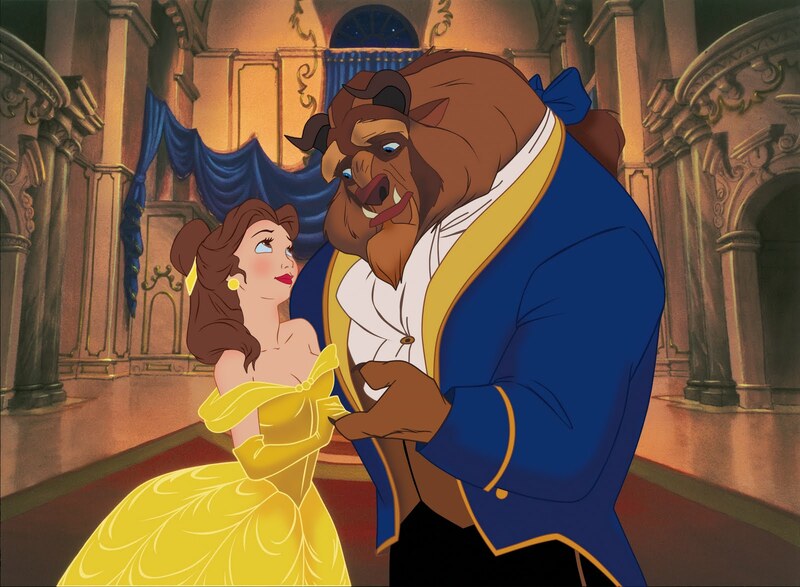 Sing along to your fave songs from the animated Disney movie "Beauty and the Beast" at the El Capitan Theatre, which is screening the film until Oct. 7. The Hollywood theater is hosting a special presentation of the 1991 movie -- complete with a live appearance from Belle at every screening -- where you and your kids will be encouraged to give a vocal shout-out to songs such as "Be Our Guest" and the title tune. For tickets, go to www.elcapitantickets.com or call 1-800-DISNEY6. Champion figure skaters Michelle Kwan and Yuna Kim will be showing off their Salchows this weekend, Oct. 2-3, at Staples Center for 2010 All That Skate LA. In addition to Kwan and Kim, the show will also feature notable figure skaters, including 2010 Olympic pair champions Shen Xue and Zhao Hongbo (China) and three-time U.S. champion Johnny Weir. “I’ve really missed performing, and to be back in Los Angeles, skating at Staples Center makes it extra special,” said Los Angeles native Kwan in a statement. Tickets range from $42-$155 (VIP) and can be purchased at www.staplescenter.com or by calling Ticketmaster at 1-800-745-3000. Performances: Saturday, Oct. 2; 7 p.m. Sunday, Oct. 3; 3 p.m.
Family-Friendly Theater: "Hamlet, Prince of Puddles"
While Shakespeare's "Hamlet" isn't on any elementary school reading list that I've seen, family-friendly theater company L'Enfant Terrible has re-created the murderous, revenge-seeking tragedy as a fun play that's also accessible to children. Playwright Angela Berliner, director Justin Zsebe and producer Seth Compton of L'Enfant Terrible have turned this depressing tale into something that they say will be a "hilarious and family-friendly adaptation of the Bard's classic." 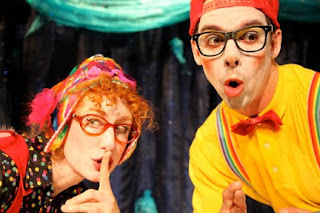 L'Enfant Terrible specializes in creating kid-friendly works, and its adaptation of "Hamlet" is making its second showing at Bootleg Theater after a successful run in the spring. 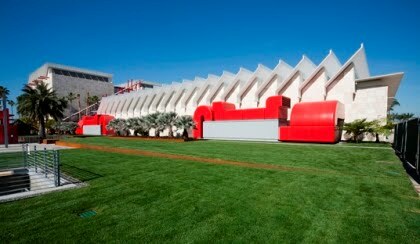 Families this weekend can check out the L.A. County Museum of Art's new Lynda and Stewart Resnick Exhibition Pavilion completely free, as the museum unveils its newest addition, designed by renowned architect Renzo Piano. The single-story, 45,000 square-foot structure will house three exhibits this fall: "Eye for the Sensual: Selections from the Resnick Collection"; "Olmec: Colossal Masterworks of Ancient Mexico"; and "Fashioning Fashion: European Dress in Detail, 1700-1915." As for the gratis community weekend, visiting families can also tune in to live music from three different bands (Oct. 2 only) and participate in crafting workshops and storytelling (Oct. 3 only). Just remember to reserve timed tickets online at www.lacma.org or the ticket office. Oct. 2-3; 11 a.m.-8 p.m. I love ABC's "Modern Family." And I basically just met them. While I've heard raves about the show from friends and co-workers, I ended up missing the entire first season because I failed to add it to my DVR lineup. Yes, that sounds totally lazy, but, truth be told, I only watch a few shows on TV, and I need them to be awesome. So when Twentieth Century Fox Home Entertainment offered me the chance to review the Season 1 DVD ($49.98) of the multicultural, gay-friendly, modern look at family life, I was game. And then I was addicted. No wonder it won the Emmy for best comedy. If you haven't seen the show -- the second season of which just kicked off and airs Wednesdays on ABC at 9/8c -- it covers three very different family units, who also happen to be related. The most traditional of the trio -- The Dunphy clan -- is headed up by Phil (Ty Burrell) and Claire (Julie Bowen). The laid-back Phil (who shows off his "cool dad" mojo by explaining texting terms like WTF? as "Why the face?" Uh, sure, that's what it means) and the uptight Claire juggle the duties of raising three kids. 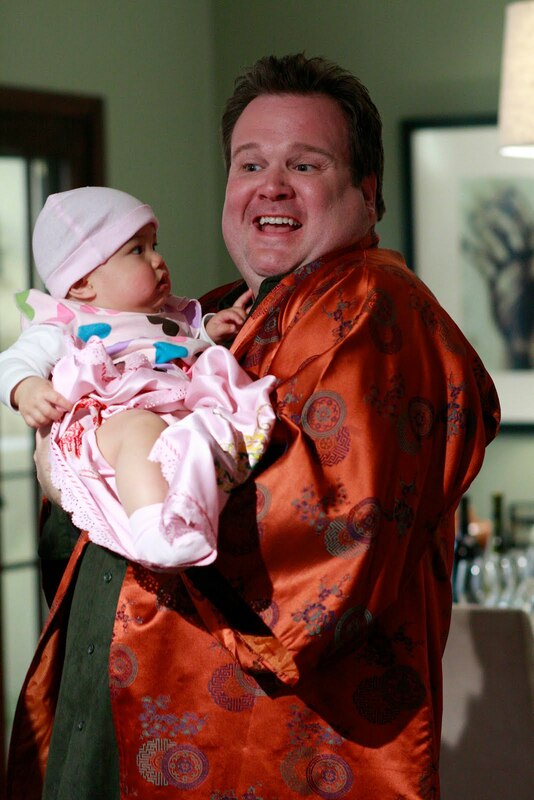 Claire and Mitchell's dad, Jay (Ed O'Neill) has recently married the voluptuous, outspoken and Colombian-born Gloria (Sophia Vergara) and is helping to raise her precocious son, Manny (Rico Rodriguez), who would rather wear a silk dinner jacket than a hoodie. You can imagine the hijinks, but the show, created by Steven Levitan ("Just Shoot Me") and Christopher Lloyd ("Frasier"), really has an amazing amount of heart. Making awkward situations accessible yet funny (Gloria finds out via Claire's son that Claire called her a gold digger; Cameron and Mitchell try to tone down their "gayness" at a Mommy and Me outing), the show touches on issues of modern family life without being preachy or dull. 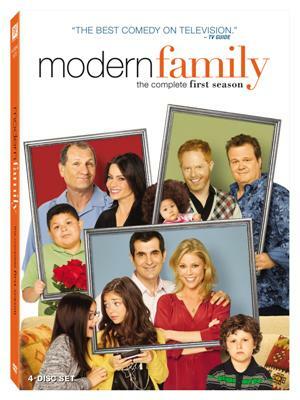 I'm giving away 1 copy of the "Modern Family" Season 1 DVD. Just leave a comment below telling me your favorite "Modern Family" moment. Or, if you haven't seen the show, tell me your craziest family moment. Good luck, and I'll announce the winner Friday, Oct. 8! Photos courtesy of Twentieth Century Fox Home Entertainment. On Sunday, CC spent the day exploring, discovering, predicting and observing at the California Science Center's "Sid the Science Kid Day." Yes, she and about a million other children. I knew the place would be crowded because it was a weekend and a special day at that, but they were literally holding people back at the front door because the spacious building in Exposition Park was overflowing with little scientists. The hands-on activities set up in the free Ecosystems part of the museum was a huge draw for curious tykes, as they scrunched sand and water between their fingers in the simulated stream (left), eyeballed sea creatures up close and used markers and crayons to record what they observed -- all in little "Sid the Science Kid" journals. While we explored the heat of the desert ecosystem and the chilly polar installation (which sported an awesome wall of ice), it was the underwater tank filled with all sorts of fish, sea life and a lone scuba diver that really captivated CC. Before we headed back home, we also got the chance to grab a gift bag and see "Sid the Science Kid" live. In a packed room with tons of adoring little fans, Sid grabbed a magnifying glass and kicked up his big preschooler heels to his theme song and other fun tunes. The kids went wild, and judging from that reaction, I wouldn't be surprised if Mr. Sid took his show on the road. 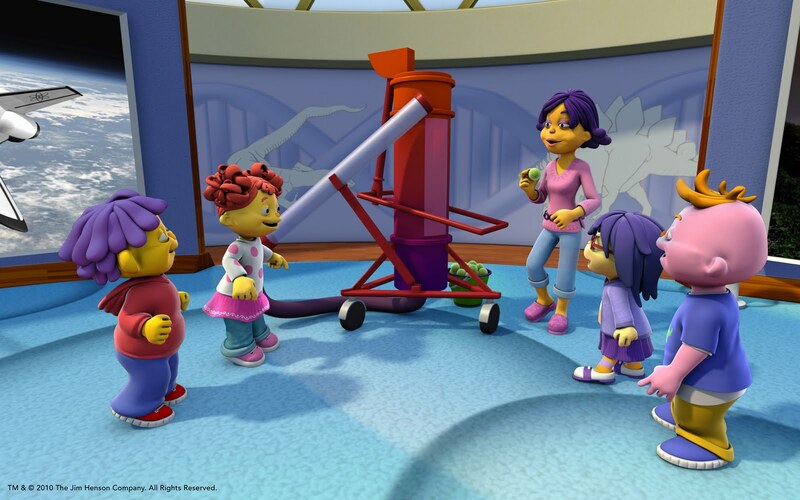 Before that happens, though, be sure to check out the new season of the PBS Kids series, which kicks off October 4 and showcases our very own California Science Center. Note: Media parking pass provided. Cigarette holders and pin curls served as the fashion of choice at last week's second annual Blogger Prom, which this year boasted the theme of "Hollywood Confidential." 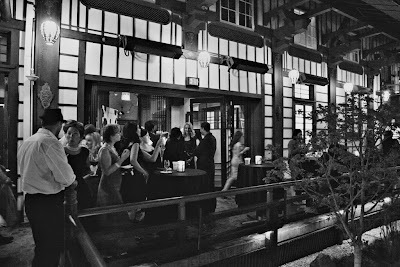 Tucked into the hills above Los Angeles at Yamashiro Restaurant, 100+ L.A. bloggers, including yours truly, indulged in some Hollywood glamour and had the chance to check out our fellow key-pounders IRL (er, in real life). In addition to chatting with the amazing Blogger Prom committee who put this shindig together (see below), I also got to meet up with Mike and Maria from Franklin Avenue, Pat from Eating L.A. (who was my date last year), writer Kathy A. McDonald and fellow mom bloggers Yvonne from Yvonne in L.A. (who took the pic on the right), Kim from House of Prince, Elise from Elise's Ramblings, Marsha from Sweatpants Mom, Mary Kay from Mommy Toolbox and comedian Amy Anderson. And not only were the digs amazing (seriously, amazing), the food and libations were just as cool. Yes, I was all over a Coolhaus sammie made with chocolate chip cookies and chocolate Cointreau ice cream. I also had the chance to sample a duck confit taco (yes, taco) from @ChefBrock, who can be found at Yamashiro's weekly garden markets. As for something to wash those down with, I sampled 12-year-old scotch from The Dalmore and got a sudsy discourse on wheat and hops from the cool Beer Chicks. Of course, everyone was all a-twitter -- literally. 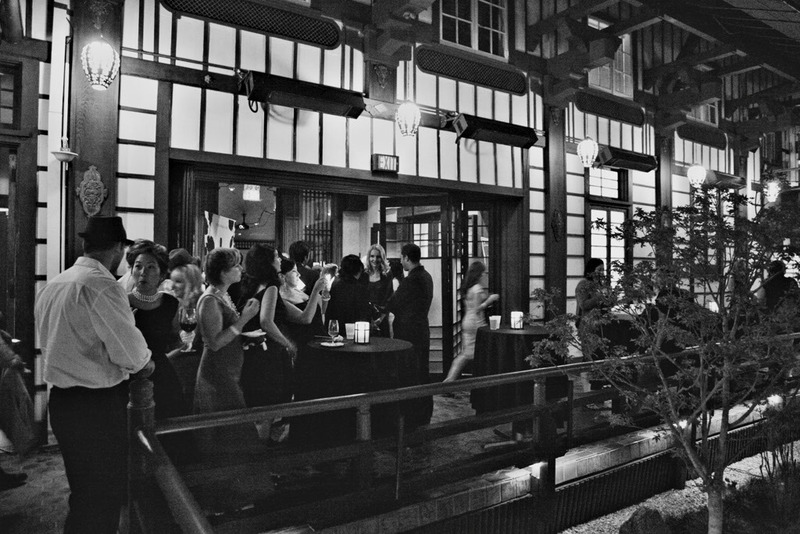 Verizon Wireless was on hand with MiFi's and computers to tweet from, and all Blogger Prom-related tweets were posted on a large screen in the Yamashiro courtyard (above left). Very cool. But even cooler? All donations benefited Operation Frontline Los Angeles, an organization dedicated to ending childhood hunger. So thank you once again, Blogger Prom committee, for organizing a truly cool event -- and amazing gift bags. Already can't wait until next year! It's pretty overwhelming to think about just how many of us have been affected by breast and/or ovarian cancer. Whether it's our mom, sister, cousin, friend or even ourselves, cancer has become an all-to-common part of our lives. In order to raise more awareness and support cancer-prevention programs, City of Hope's Women's Cancers Program has kicked off "All In Week." Launched Sept. 23 and continuing through Oct. 1, City of Hope, the independent biomedical research, treatment and education institution based in Southern California, has initiated fun and meaningful ways readers can participate in the campaign. 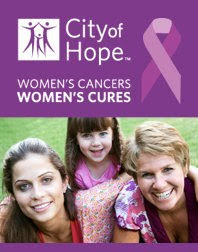 · Spread the Word: Join City of Hope’s Facebook page at http://www.facebook.com/womenscancers and follow the Twitter conversation @CityofHope. Invite your friends and family to join you. · Walk for Hope: Get moving and sign up for a City of Hope Walk for Hope event. Find a Walk for Hope near you here. Cancer is such a big, daunting word, but City of Hope is offering simple actions through its "All In Week" that are manageable -- not to be confused with small. Congrats to Thien-Kim and justJENN, who won the "Strawberry Shortcake: The Glimmerberry Ball Movie" DVDs! Please email me at losangelesstory@gmail.com to let me know where to send the DVDs. Thanks to everyone who participated, including my faithful reader and awesome friend, Pokie! Kids get crafty at the Ace Hotel in Palm Springs, courtesy of Kimmel Kids and Splendid. Los Angeles-based artist and mother of two Karen Kimmel has created the art of the family getaway. 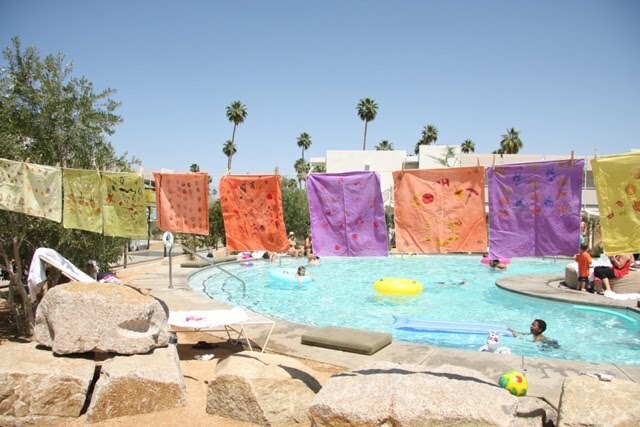 On October 8-10 at the ultra-hip Ace Hotel in Palm Springs, parents and little ones can take a break from the hectic L.A. scene and join Kimmel and other talented artists for, as she puts it, a weekend of crafting, community and creativity. Started as a way to bring families closer together, "Crafting Community," is a three-day escape ($695; more info below) presented by Kimmel's children's educational line Kimmel Kids and clothing boutique Splendid that offers artistic workshops in underwater photography, skateboarding, pottery, macrame and more. For Kimmel, it was that mix of art, family and community that really inspired the idea for the weekend. "I have a lot of experience interacting with the community through art installation, and I really liked it," Kimmel said. "And then having my own kids and seeing how easy it is to slip into routines and miss an opportunity to either interact with parents at school because you're just dropping your kids off or just because how fast-paced life is" also served as the impetus for the project. In addition to daily workshops, families also have the opportunity to meet other families at a morning yoga class or by just kicking back in the evenings while listening to storytelling under the starry desert sky. Kimmel's goal, she said, was to "create an opportunity for everybody to slow down and make some things together, to spend time together as a family and do something creative." In addition to Kimmel and other artists, "Crafting Community" draws on the expertise of another mom-founded organization, the hospitality-focused consulting company Kid Concierge. Created by former children's boutique owner Stacy Bernstein and event producer Tait Chatmon, Kid Concierge is all about taking kid-friendly brands and experiences to the next level. Both Bernstein and Chatmon were able to blend their work experience with their mom experience to form a company that caters to family-focused products and events. "Even though we were passionate about our careers, we were even more passionate about our kids," said Bernstein, explaining how she and Chatmon began their company. "I was so excited by all the modern and creative and unique options there were for new moms." Chatmon added. As far as partnering with Kimmel, Bernstein said that it seemed like a natural fit, especially because Chatmon and Kimmel were already connected. "We just saw an opportunity to bring our businesses together," Bernstein said, "to really elevate this program that (Kimmel) had envisioned and then bring our resources in." They also wanted "to take it to the next level from a hospitality standpoint," she added. "And to bring it to a hotel and create this entire experience and weekend that really nurtures the family relationship." And while the weekend does implement art as a way to bring families themselves closer together, Kimmel also said it's about the greater dialogue between a community of families: "where people get to know each other and maybe say, 'I go to that school, too. We should carpool.' "
Click here to enter to win an all-inclusive "Crafting Community" weekend. 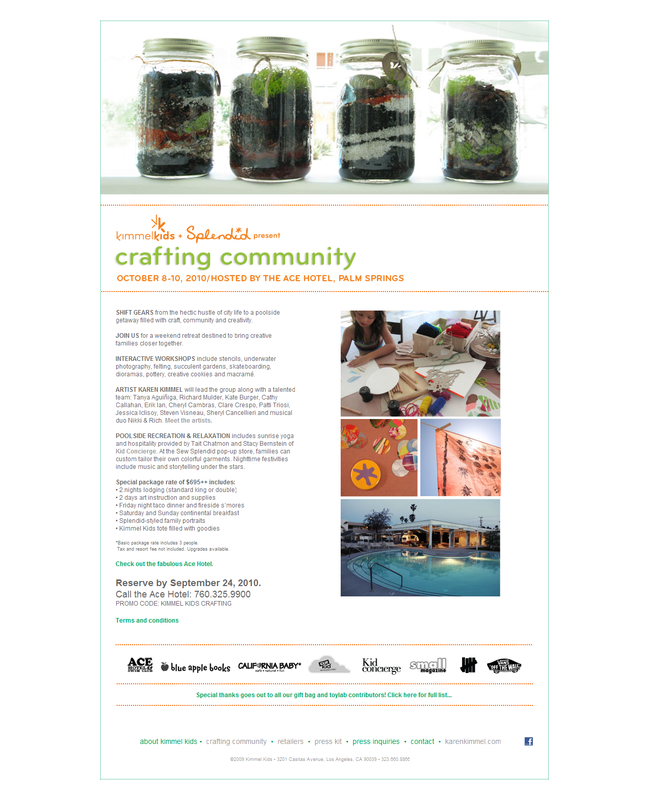 Kimmel Kids + Splendid present "Crafting Community"
*Basic package rate includes 3 people. Tax and resort fee not included. Upgrades available. Reserve by Sept. 24 for special rate. Please check out my latest post on CBSLosAngeles.com, "Family Events Around L.A."
From a kids' cooking class to a sing-a-long movie to a Creepy Crawly Creature Feature, there's tons to do with the fam this weekend. Congrats to kmajda who won the super-quick parking giveaway for Sunday's "Sid the Science Kid" event at the California Science Center! Hope you have an awesome time exploring! We might see you there! Just email me at losangelesstory@gmail.com and let me know what name to leave at the front gate. Adiri and WaterGeeks bottles on display at Falcon Hollywood. When CC wasn't busy charming actress/mom Tia Carrere at the Adiri Ultimate Nurser party at Falcon Hollywood last week, she was busy watching me indulge in a little mommy pampering. To celebrate Adiri's launch of its BPA-free bottle, parent company WaterGeeks and hostess Carrere (right) invited attendees to sample mini cupcakes, a candy buffet, music and massages, courtesy of companies including Debibilicious Cupcakes, Life Is Sweet and VeraBella Spa. Not only that, but yours truly won a Britax B-Ready modular stroller in one of the party's generous raffles! As singer/songwriter Rachel McGoye strummed her guitar on the outdoor patio at Falcon, guests mingled, sipped wine, explored products from Aden & Anais, WaterGeeks and Serena & Lily, and waited patiently for coveted massages. All of this pampering was to showcase Adiri, which is considered to be a new kind of baby bottle. Designed to replicate the shape of a breast, the bottle itself is soft, durable and a multitasker -- it doubles as a snack container. It's also BPA-free, a big plus for plastic bottles. WaterGeeks CEO Brent Meikle, who also is an executive producer of film "Flow: For Love of Water," was on hand to tout Adiri. He mentioned that the company will be making an announcement on Oct. 10, when they will launch a "major new initiative" to make the "safest food and beverage products for your whole family." Looks like we'll have to stay tuned. In the meantime, I'm happy to remember the gorgeous night, my child posing on the green carpet and the peanut butter and jelly mini cupcake that became CC's favorite part of the mom-friendly evening. And, about that awesome Britax stroller? I'm handing that over to friend, fellow blogger and mom-to-be Vanessa, who blogs at Little Gray Pixel. Congrats! in "Sid the Science Kid." 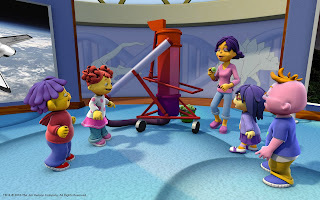 "Sid the Science Kid," the PBS Kids series about a precocious preschooler produced by The Jim Henson Company and PBS, will be heading to the California Science Center on September 26 from 11 a.m.-3 p.m. to visit other little scientists for "Sid the Science Kid Day." In honor of the show's upcoming season, this free event will encourage kids to explore the Ecosystems exhibit at the California Science Center, which will be featured in the new season of "Sid the Science Kid," premiering October 4. While admission to the California Science Center is free, parking is $8 per car. That's why I'm giving away 1 parking pass for the event. Just leave a comment below telling me your favorite "Sid" character. Good luck, and I'll announce the winner on Wednesday, Sept. 22! The Library Fairy claps with kids during story time at Kuki's Playshop. Tucked into a Burbank business district just off of Victory Place is Kuki's Playshop, a special play space for small children that blends imagination, creativity and movement. With its gingerbread-baby mascot Kuki (pronounced "cookie") making appearances on murals, T-shirts and as a super-soft puppet, Kuki's Playshop serves as an inviting tot spot that makes playtime easier for little ones because it's just for them. CC and I had the chance to visit Kuki's on Saturday for the Playshop's grand opening Children's Festival. In addition to playing carnival games, checking out Mommy-Baby yoga, exploring colorful items from Discovery Toys and leaping into the indoor ball pit and toy treehouse, CC also had the opportunity to listen to The Library Fairy tell the story of "Conejito," the little bunny that meets a few hungry predators on his way to visit his Tia Monica. Tapping on her drum and encouraging the kids to clap and sing, The Library Fairy had CC hooked from the moment she appeared in her purple pigtails and wings. "She's a good listener," The Library Fairy said to me about CC after story time, which, of course, made me high-5 myself in my mind. Most of the children who attended were from the "3 years and under" set, and that's exactly what Kuki's Playshop creator and founder Aimee Hui had in mind. With degrees in education and a certificate in arts management, Hui has made it her mission to provide early childhood programs for kids in the L.A. area, particularly around Burbank, where she noticed a need. CC's right on the cusp of outgrowing a program like this one, but this would have been great for her at 1, 2 or even the beginning of 3. Giving smaller children the opportunity explore their world through music, stories and dance -- on their level, with smaller toys and smaller spaces -- is something that's special and so worthwhile. It's winter time in Berry Bitty City, so Strawberry Shortcake and friends are preparing for the occasion by carving lovely lanterns and exchanging secret gifts in the recently released DVD "Strawberry Shortcake: The Glimmerberry Ball Movie." The CGI-animated DVD (MSRP: $14.98), from Twentieth Century Fox Home Entertainment and American Greetings, runs about an hour but is divided into three manageable story lines that have the Strawberry Shortcake pals overcoming obstacles, dealing with frustrations and ultimately working together to celebrate the winter holidays in style. In the first outing, Strawberry and friends are playing a kind of "Secret Santa" game, and "re-gifting" is taken to a whole new level. Bookworm Blueberry Muffin finds the, uh, perfect gift for her giftee, Lemon Meringue -- a book about organizing books. (Yawn. Well, that's Lemon's reaction, anyway.) So she gives it to Plum Pudding, who gives it to Orange Blossom, who gives it to ... well, somehow it gets back to Blueberry, who loves it, but then realizes something's up. It's a story about giving friends gifts that they'll like, rather than something you would like to have for yourself. The two other stories find the girls discovering the traditions of the Glimmerberry lanterns and preparing for the Glimmerberry Ball. Special features include a sing-along, read-along storybook and printable coloring pages. 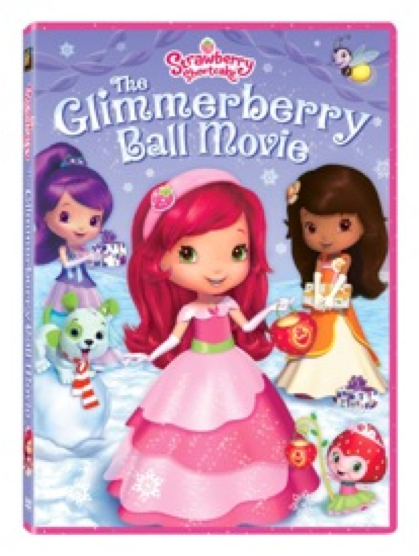 I'm giving away 2 copies of "Strawberry Shortcake: The Glimmerberry Ball Movie" DVDs. Just leave a comment below telling me your favorite winter-time activity. 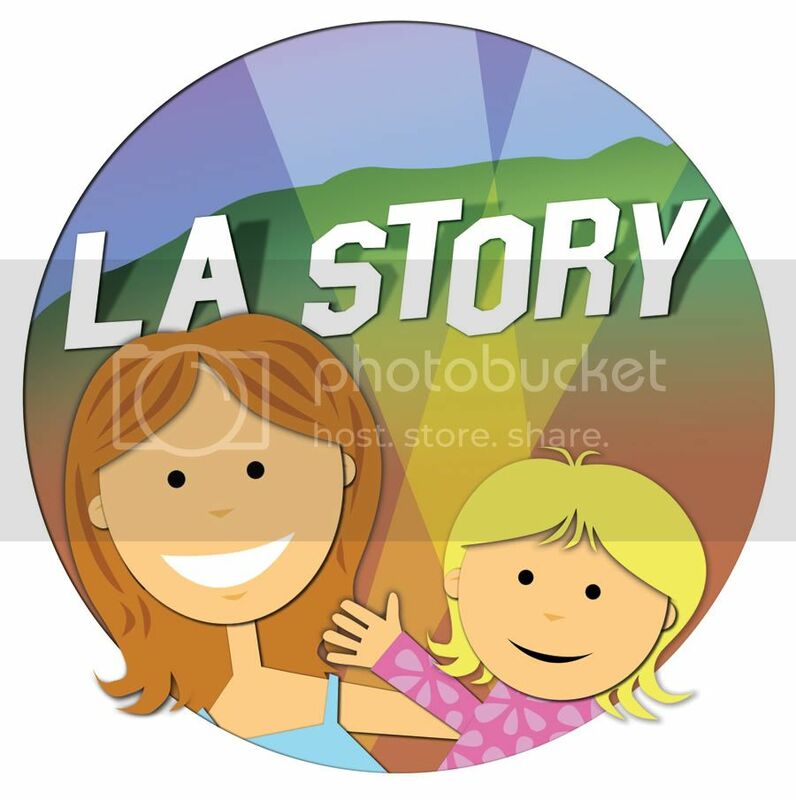 For extra entries, "Like" the L.A. Story Facebook page OR follow me on Twitter at @la_story. Remember to leave additional comments letting me know you did so. Good luck, and I'll announce winners Friday, Sept. 24! second from left, in "Berrywood Here We Come." Congrats to Ruth and Kirstin, who won the "Strawberry Shortcake: Berrywood Here We Come" DVDs! What great Hollywood stories! I laughed out loud at the "Hollywood" spells "church" comment. Please email me at losangelesstory@gmail.com to let me know where your DVD should be sent. Thanks so much to everyone who participated, and stay tuned for another "Strawberry Shortcake" DVD giveaway coming up this weekend. Kuki's Playshop in Burbank will be hosting its inaugural Children's Festival on Saturday, Sept. 18, to celebrate the early childhood play center and boutique's grand opening. From 10 a.m.-3 p.m., kids can meet characters, listen to stories, play games, show off their costumes and watch a storytelling performance from The Library Fairy at 11:30 a.m.
Kuki's Playshop is also offering 2 free sample sessions of themed programs for the end of September. Click here to register. 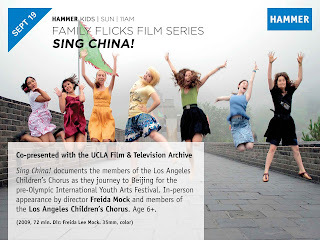 Children's Festival: September 18; 10 a.m.-3 p.m.
Hammer Kids Family Flicks Series will present documentary "Sing China!" 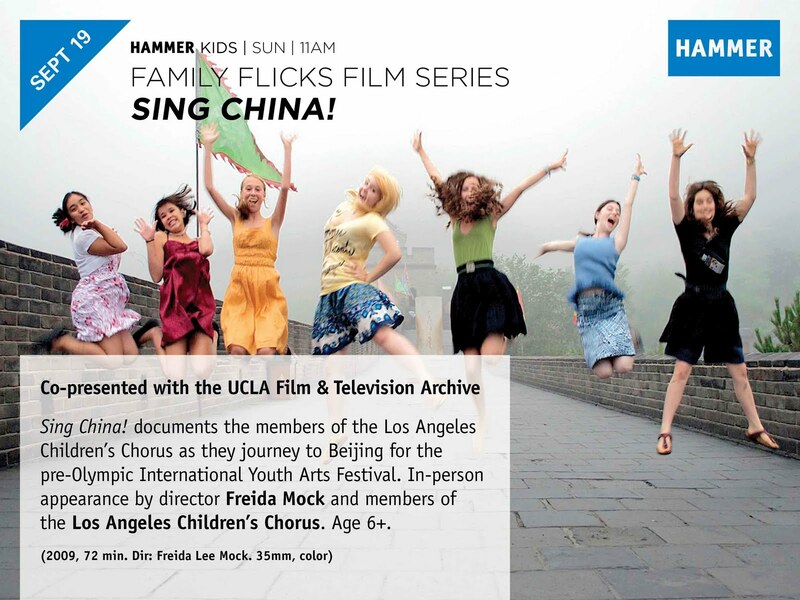 on Sunday, Sept. 19 at 11 a.m., about the Los Angeles Children's Chorus' trip to Beijing for the pre-Olympic International Youth Arts Festival. 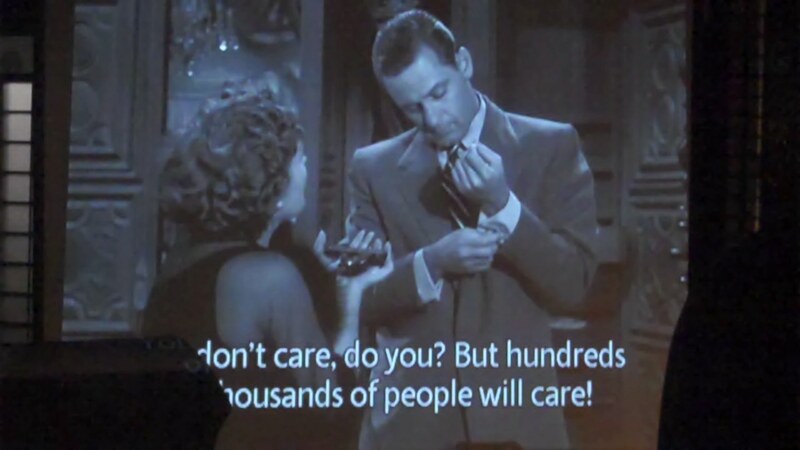 The film's director Freida Lee Mock, as well as members of the chorus, will also be on hand at the screening. If you're looking to make that documentary about being a mom in Los Angeles, Film Independent's California Documentary Grant Workshop should be a great place to start. After all, when it comes to filmmaking, money is certainly a huge consideration. On Sept. 21 at 7 p.m. as part of Film Independent's Filmmaker Tuesdays program, the organization has invited the California Council for the Humanities to provide information about its competitive 2010 California Documentary Project (CDP) grant. According to FIND's website, "CDP supports film, radio and new media projects that document the California experience and explore issues of significance to Californians." There are two types of grants: Production (grants ranging from $20,000-$50,000); and Research & Development (grants up to $7,000). The application deadline is Nov. 1. "Everday Sunshine," a documentary that screened in this year's Los Angeles Film Festival, received a grant from the program. Tuesday, Sept. 21; 7 p.m.
Reservations required: 310-432-1222 or Reservations@FilmIndependent.org. Admission is free to Film Independent members. For the most part, I can usually count on horse-racing films to be both heart-breaking and glorious. Heart-breaking because so much is at stake, and glorious because watching those gorgeous animals inevitably barrel across a finish line never gets old. What I didn't know about the story of Secretariat, the horse that won the Triple Crown in 1973, is that there was a very strong woman behind his success. That's the story Walt Disney Pictures tells in its movie "Secretariat," starring a steely yet graceful Diane Lane as his owner, Penny Chenery. It was the perfect mother-daughter movie to see with CC, who kept trying to say "Secretariat" until she got it down perfectly. We caught an advanced screening in Santa Monica (the movie opens October 8), courtesy of the Los Angeles International Children's Film Festival, which begins next month. In movies like this one, it's usually the horse that's the underdog ... so to speak. In "Secretariat," it's Penny -- aka The Housewife. Not only does she have to deal with all sorts of sexism and being outright dismissed as not having any real "horse sense" (sorry), she also has to balance her work life (overseeing Secretariat) in Virginia with her family at home in Denver. As a result, her husband (played by Dylan Walsh) ends up feeling as if he's been pushed to the sidelines, essentially losing first or even second place to a winning Secretariat. While Penny navigates those rough waters, she's buoyed by her team of trainer Lucien Laurin (played with eccentric verve and humor by John Malkovich), assistant Miss Ham (the formidable Margo Martindale) and groom Eddie Sweat (played with real tenderness by Nelsan Ellis). But it's watching Secretariat essentially burn up the race track that really gets hearts pounding. What adds to that thumping is knowing what it took to get him there -- the sacrifices, the gambles, the determination of a woman who found something she was really good at and ran with it. CC enjoys the spinning teacups at the L.A. County Fair. With giant turkey legs, donuts the size of your head and waffle cones on the menu, what's not to love about the L.A. County Fair? And that's just the food! OK, yes, we did more than just eat at the sprawling Fairplex in Pomona. In fact, we packed so much in that we arrived home exhausted shells of our former selves -- but with great tans. Our first stop was FairView Farms and its giant petting zoo, which held hungry but gentle cows (little ones), goats (of course), chickens and alpacas. This was CC's favorite part, by far. Goats of all sizes crowded around my little preschooler, nosing around her tiny hands, looking for treats. While she loved the attention, she ultimately found it to be a touch too much. "They're too sniffy on me!" she said as we were leaving, post hand-washing. After that, we made our way over to the pony rides ($6); the Kids' Zone, featuring pint-sized carnival rides like the teacups pictured above; and the adorable Princess Playhouse, where CC dressed up in a royal blue gown and shoes. She even took home a small crown to decorate ($1), which was perfect for the car ride home. After chilling out (literally) in the L.A. in Ice exhibit ($1 admission), which featured Los Angeles landmarks like the Hollywood sign carved out of ice, and getting a little scare in the dinosaur-themed Jurassic Planet (the snorting and growling didn't appeal to CC at first), it was time to head back home. We had been well fed, well entertained and were, well, tired. Well, I'm a day late to my own Blog-iversary, but I did do some unintentional celebrating yesterday when I walked past a patch of downtown L.A. that was once sprinkled with goats. Yes, goats -- a common theme here at L.A. Story. If you remember back to two years ago today, I posted my first bloggy adventure with CC. In the morning before work, I scooped up my then 1.5-year-old child and drove down to the Bunker Hill area of downtown to check out the City's alternative to lawn mowers. We've come a long way since two years ago. We've visited even more exciting places in and around Los Angeles -- Legoland, the Dorothy Chandler Pavilion, the Hammer Museum, the L.A. Film Festival, just to name a few -- and I think we're both the better for it. So it was funny to walk by that patch of grass next to Angel's Knoll yesterday and remember the first adventure that started everything. I told Ian, who was walking with me after our lunch at the historically kitschy Clifton's Cafeteria, dessert at Bottega Louie and a ride down Angel's Flight, that were it not for those goats and dragging CC to see them the day after I started this blog, I might not have allowed it to grow and flourish the way it has. I needed something to go and do -- an experience, and L.A. experience -- to go out of my way for, and then to write about. I needed a start -- and, for some reason, it came in the form of urban livestock. So, thank you, readers. Thank you, goats. And here's to another year! Congrats ReelMike84 for winning the 2 tickets to the L.A. County Fair! Hope you enjoy lots of deep-fried Oreos -- or maybe just one is enough. Please email me at losangelesstory@gmail.com with your address. Thanks again to everyone who participated! And thanks to Random.org for being so decisive. And, as always, stay tuned for more fun giveaways. 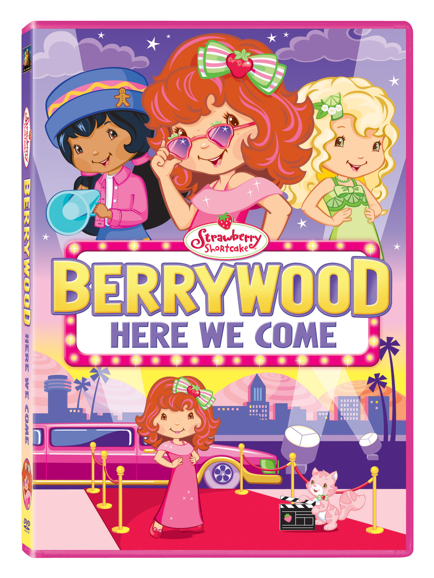 It's all about Hollywood, er, Berrywood in the recently released DVD "Strawberry Shortcake: Berrywood Here We Come." 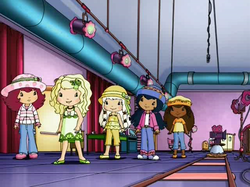 Before the lovable Strawberry's recent CGI makeover, she and the gang -- including Orange Blossom and Ginger Snap -- made their way to the bright lights and big city to visit Strawberry's childhood friend-turned-movie star, Limelight. Eager to connect with her old friend, as well as see how movies get made, Strawberry is suddenly disappointed when she sees the darker side of stardom. I'm not talking Limelight as Lindsay Lohan, mind you, but this little girl is definitely short on empathy and long on ego. The girls realize they have to work together to show Limelight that she should share the glow with others for a change. CC was a big fan of the DVD (MSRP: $14.98), from Twentieth Century Fox Home Entertainment, American Greetings and The Cookie Jar Group, which also includes another Strawberry Shortcake adventure, "Hooray for Berrywood! ", and printable coloring pages. An added bonus for me as a parent was seeing CC notice that Limelight "wasn't being nice," as she said. Nice job, CC! 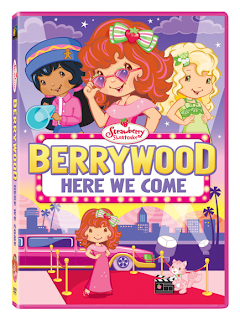 I'm giving away 2 copies of "Strawberry Shortcake: Berrywood Here We Come" DVDs. Just leave a comment below telling me your favorite part of Berrywood, er, Hollywood (past or present). Good luck, and I'll announce winners Friday, Sept. 17! in Thousand Oaks and Long Beach. 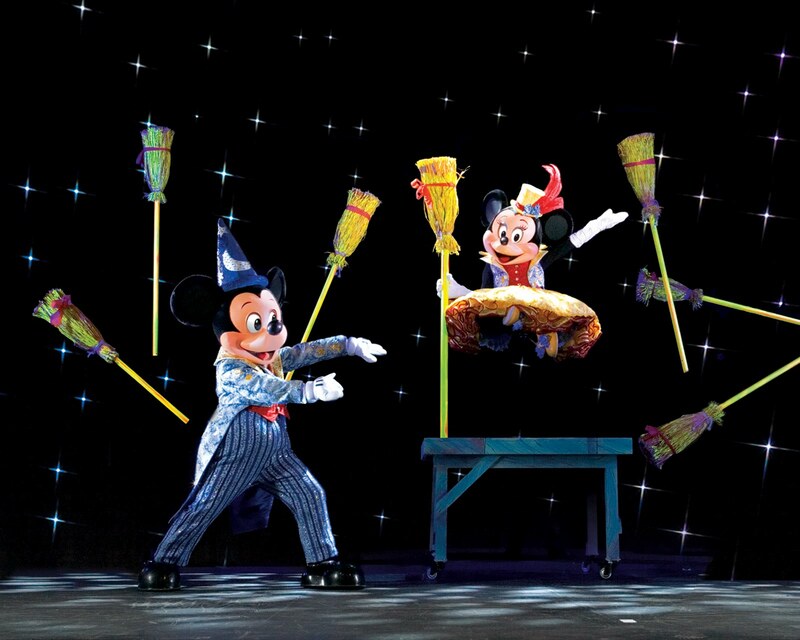 Mickey and Minnie Mouse are up to some new tricks in their latest stage show, Disney Live! Presents "Mickey's Magic Show," which will be heading to the Los Angeles area Sept. 24-26. Making its first stop in Thousand Oaks at the Fred Kavli Theatre (Sept. 24) and then moving south to the Long Beach Terrace Theater (Sept. 25-26), the Disney show will offer illusions as well as special guests. From Cinderella to Goofy to Aladdin and Princess Jasmine, kids will get more than a glimpse of familiar faces. That's in addition to the professional illusionists who will be joining the characters on stage. Tickets range from $20 to $65 (Front Row), but L.A. Story readers can receive a special $3 discount (excludes Front Row seats) by using the code MOM at Ticketmaster.com or by calling 800-745-3000. Disney Live! Presents "Mickey's Magic Show"
Because my cup runneth over yesterday, I wasn't able to get to all the fun stuff from the Los Angeles Times Celebration of Food & Wine. Don't get me wrong, there is definitely room for improvement at next year's incarnation of the huge food fest, but more on that later. First, I wanted to include the below video of Cooking Channel chef Aida Mollenkamp ("Ask Aida," "FoodCrafters"). As an aunt of little kids, she's had to get creative in the kitchen to keep them interested and entertained. Check out what methods she's used. * Natasha Case, co-owner of Coolhaus Ice Cream Truck, said food trucks that use social media definitely have their superfans (aka stalkers). One woman, she said, drove all the way from San Diego to Brentwood for a sammie. * Angela McCluskey, Scottish singer/songwriter and the opening concert act, was awesome. Hilarious and great voice. Reminded me of a Shag drawing. * Proceeds benefited charities Share Our Strength and the Los Angeles Times Family Fund. Awesome. * More seating. Lots of people were stuck sitting on the ground with loads of food and drink. * Line control. There were just mobs of people near the end of the evening crowding booths because there was nowhere else to go. Overall, it was a great opportunity to bond with fellow L.A. foodies and to listen to music and sip wine with awesome music on a lazy Labor Day weekend. And remember: Handstand Kids Cookbooks is still offering L.A. Story readers 20% off with the discount code HSK20 at www.handstandkids.com. Note: Press pass with drink tickets provided. It was definitely feast without the famine at the inaugural Los Angeles Times Celebration of Food & Wine on Sunday. Culinary experts and wannabes (*cough* me *cough*) packed Paramount Studios' back lot, infusing the New York and Brooklyn facades and landscapes with enough people that you might mistake the busy pseudo streets for the real deal. While I dined on ice cream from Carmela (love the salted caramel) and beef brisket from Uncle Lau's Island BBQ -- not to mention wines from all over California -- I also got to meet up with some very interesting kitchen experts. Check out the below videos of my interviews with Yvette Garfield from Handstand Kids Cookbooks and Cooking Channel's Roger Mooking ("Everyday Exotic"). The California-based Garfield offers fun cookbooks for kids -- Mexican, Italian, Chinese -- that really get children involved in the cooking process. She even offered a special discount for L.A. Story readers. 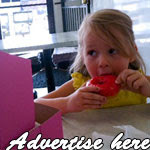 When ordering online at www.handstandkids.com, use the code HSK20 to receive 20% off your order. She gave me the Italian cookbook, complete with chef's hat, and CC is already exited to start making Italian sodas and lasagna. Stay tuned for Part 2 tomorrow, when I'll include my video interview with Cooking Channel's Aida Mollenkamp as well as a few tasty tidbits from food truck vendors and Q&A's with food blogger and mom Ree Drummond (aka The Pioneer Woman), LA Times Food Editor Russ Parsons and LA Times Test Kitchen Manager Noelle Carter. And lots more photos for dessert! While many of you have already secured tickets to the inaugural Los Angeles Times Celebration of Food & Wine event on Sunday, there are those of you who are curious but otherwise engaged. 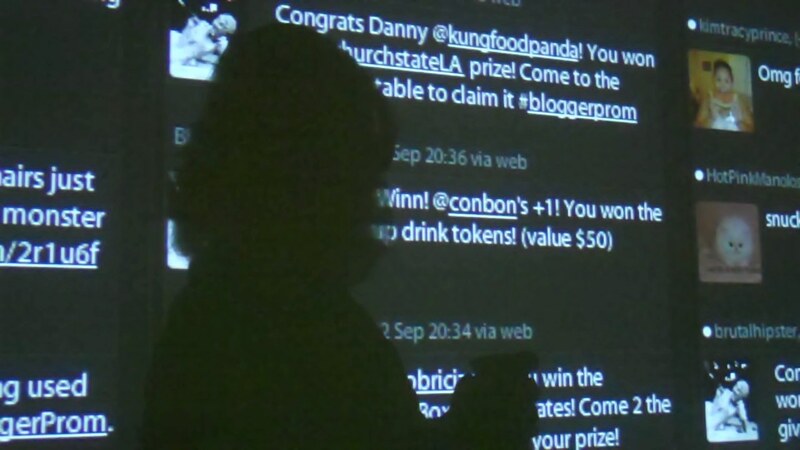 Lucky for you, you can submit your questions via Twitter to @LATimesEvents with the hashtag #latfoodwine. Otherwise, I'll be there to fill you in once you get back from that trip up the coast. Even when you're the biggest canine on the block, it doesn't always mean you're the top dog. So goes the story of "Marmaduke," the amusing live-action movie based on Brad Anderson's popular comic strip that arrived on DVD ($29.98; Twentieth Century Fox Home Entertainment) Aug. 31. With the endearing Owen Wilson voicing the role as the titular Great Dane, Marmaduke and his family find out in short order what it's like to no longer be in Kansas anymore. Literally. The movie kicks off with the Winslow family moving from a rural existence in Middle America to the relatively more hip environs of "The O.C." (aka Orange County, Calif.). Dad Phil (played by the affable Lee Pace) lands a lucrative marketing job for an organic dog food company (run by a persnickety dog lover played by William H. Macy) and wants to show the wife and kids "the good life." 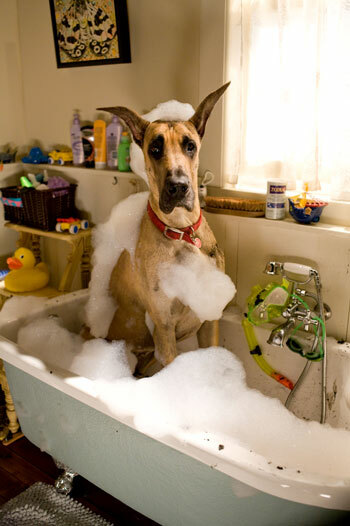 And while the family is resistant to moving across the country, the lovable yet clumsy Marmaduke is ready and willing to follow the fam anywhere -- as long as not too many baths are involved. Marmaduke's the new kid in town and has to learn his place in the neighborhood dog park. A big, bad bully (voiced with menace by Kiefer Sutherland) wants to keep ol' Marmaduke out of the pure-bred circle. That leaves Marmaduke hangin' with not only his feline friend Carlos (George Lopez) but also the outcasts -- aka mutts -- while still longing to be one of the "popular" canines. It's through this effort of trying to fit in -- something Phil has trouble with himself -- that gives the movie its heart. With familiar themes of being proud of who you are and listening to those who matter most even when it doesn't suit your plans, this movie is a good one for the family. CC especially loved an early sequence when Marmaduke leaps out of the bathtub, with Phil hanging on by his tail. The DVD extras were cute, particularly the "Cowabarka! Surfing Dogs" clip -- which is a big set piece in the movie. There was also one deleted scene that would've worked well in the film -- a moment when we learn the origin of Marmaduke's name. A few L.A. moms, dog owners and I got to meet "George," the Great Dane that plays Marmaduke in the movie, at Three Dog Bakery in the original Farmers Market earlier this week. The bakery offers all-natural, delicious-looking treats to canines and was the perfect place to meet the adorable and friendly George. They even served up (non-dairy) doggie "ice cream" for the occasion. Since CC was in preschool at the time, I snapped pics of my friends who were there, including Bernadette and her daughter (above). If CC had been there, though, I'm sure she would have tried to ride him. Not sure how well that would've gone over. CBS Los Angeles, the website, has re-launched with a more local focus, and guess who's a contributing writer? Yes! Yours truly is among a group of in-the-know L.A. moms who are offering our two cents' worth about fun things to do, see, buy, wear and eat in the city. Check out the "Best of LA" family section, and you might see some familiar names, including Sarah Auerswald from Mar Vista Mom, Yvonne Condes from Yvonne in LA, Elise Crane Derby from Elise's Ramblings, as well as our editor, Kim Tracy Prince from House of Prince. Stay tuned for more insider L.A. info!